I have been working on a painting of Jesus being baptised by John the Baptist in the River Jordan for the past two months. This is a monumental project for me as I am extremely aware of the fact that we all have our own personal idea of how Jesus would look. I have tried to portray him as I believe the children that attend John the Baptist School in Plymouth, would be able to relate to him. This painting is for them. This is my official Christmas Painting for 2014. 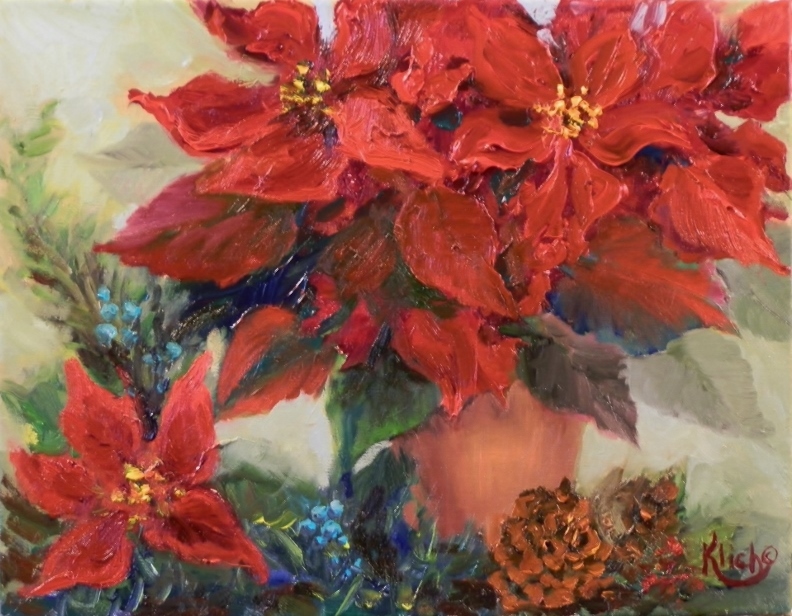 I love poinsettias and must admit that there is one in almost every holiday painting I have completed. I have been creating a new painting for Christmas each year since 1993. There is an old legend from Mexico about the flower, that I will share with you, my reader. It was Christmas Eve and all of the townspeople were taking their gifts to the church to be given to the Christ Child. One little peasant boy, who was very poor knelt in the snow and cried because he did not have anything, at all, to give to the baby Jesus. Suddenly, right there, where his tears had been falling in the snow the most beautiful red flower grew. He picked his prize, took it into the church and laid it at the foot of the cradle, where all of the people gathered around astonished at the miracle. The flower became known as the flower of the Night and was later given the name poinsettia. On another of my stops, on my way to California, this summer of 2015, I had the opportunity to stop and have my first look at the Grand Canyon. While time was short and I could only stay a few hours, never have I been more aware or affected by the beauty of the Southwest region of the United States. Standing on the South Rim of the canyon, looking out over the rugged landscape of this untamed area filled me with a sense of awe. It called me to try to capture it on my canvas. I knew that doing so would not be an easy journey, for me as a painter, even if the changing colors and fabulous shapes were a feast for my eyes. I chose, carefully, the out cropping with the tree on it as my focal point, being sure that a great deal of the canyon could be seen beyond. 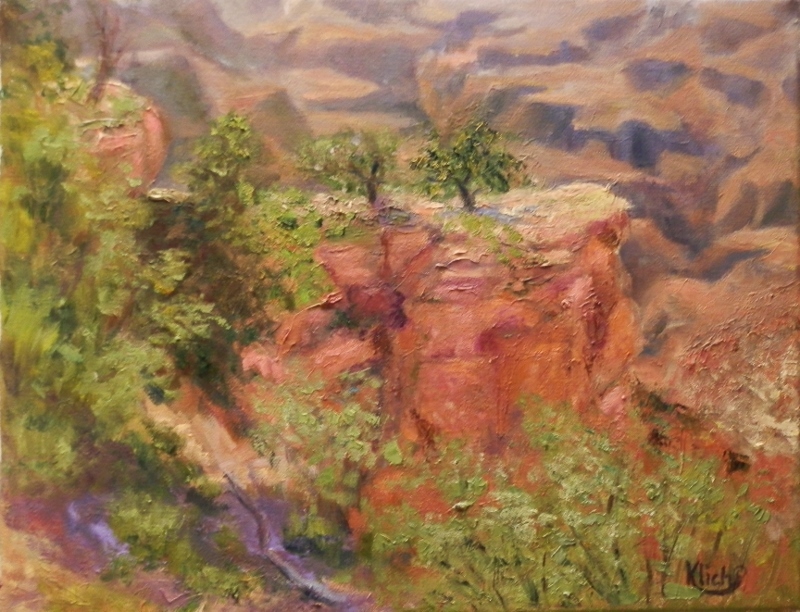 To view this episode of Painting Journeys please click on “Grand Canyon” South Rim. On my way to Southern California, I had the opportunity to make a quick detour and drive through the Petrified Forest National Park in Arizona. According to the signage in the park, that area of Arizona was covered with a dense, lush forest millions of years ago. Because of the extreme climate changes and floods through the ages, the forest was covered with silt and the trees underneath became petrified. (Please excuse my overly simplified explanation here, I have the most unscientific mind of anyone I know). What we now see as a very harsh landscape is the result of the ever changing climate conditions throughout those years. My favorite location in the park was the Agate Bridge, a fallen petrified tree about twenty five feet in length, that over the years had turned into agate. As you can see in the painting of it, the tree is supported by a cement piece running the length of it. This helps preserve the tree during the spring flooding. I can just imagine the Native Americans thousands of years ago, of which there was plenty of proof of in the remains of dwellings and other items they utilized at that time, making use of the Agate Bridge, rather than taking the long way around to come home. 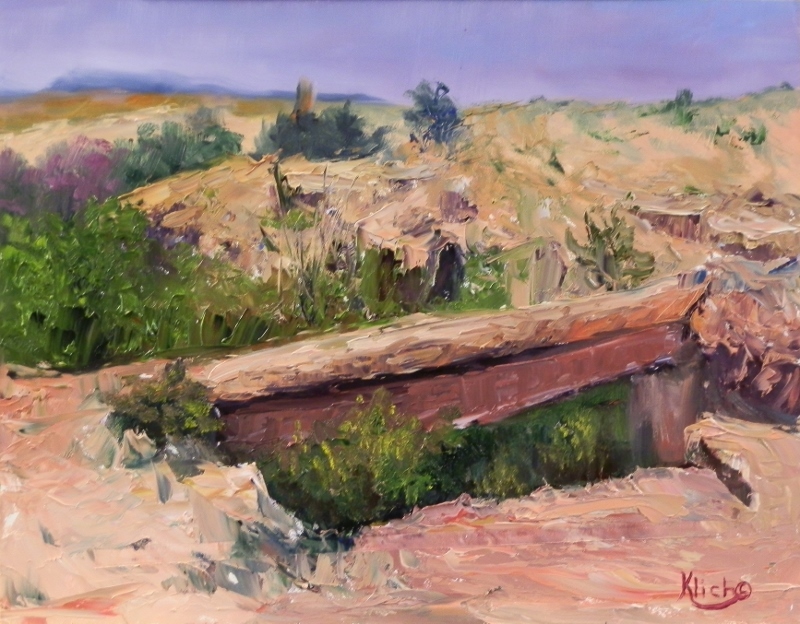 To view this episode of “Painting Journeys”, click on the highlighted title of the painting, “Agate Bridge”, Petrified Forest National Park, Arizona or go to http://www.wscssheboygan.com. Go to VOD (video on demand), select the playlist “Painting Journey” “Agate Bridge”, Petrified Forest, AZ. Just off Highway 141, in the quaint little town of Suamico, Wisconsin, twenty-one miles north of Green Bay, is a beautiful little covered bridge, crossing a creek, on the west side of the road. Covered bridges are becoming a rare sight as there are not many to be seen as you journey through the countryside. I chose to capture this one on my canvas and spent a marvelous day painting out in the fresh air as I rendered it as a value study to be completed in color on my show. A value study is where you paint with only one color to establish a pleasing pattern of lights and darks on your canvas. 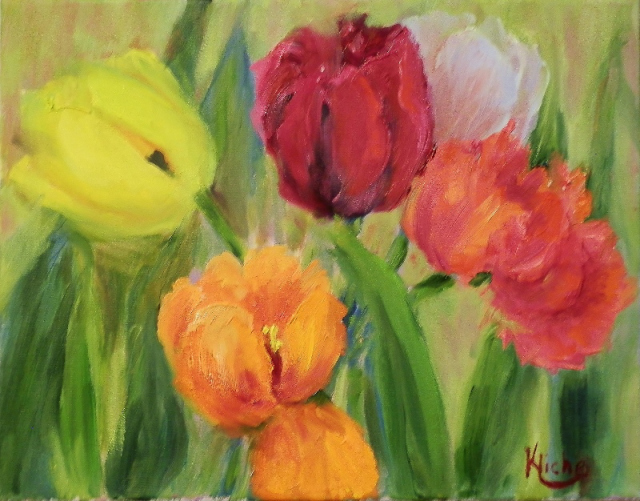 This method of “under painting” has been passed down for many generations from the days of the old masters. 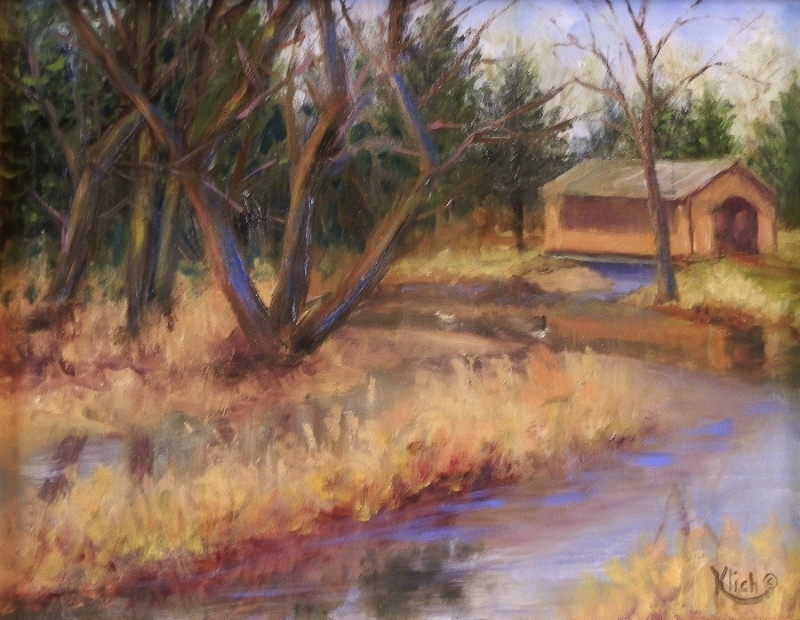 To view this episode of “Painting Journeys”, click on the highlighted title of the painting, “Covered Bridge” Suamico, WI, or go to http://www.wscssheboygan.com. Go to VOD (video on demand), select the playlist “Painting Journeys.”Covered Bridge“ Suamico, WI. It is usually very overcast, rainy or misty along the “Pacific Coastline” in Washington State. Normally, a sun lover, there is something about the natural beauty that draws me back. I don’t mind what the weather may be like, the scenery is breathtaking anytime, no matter when I travel there. On this trip I had the opportunity to view a mist laden tree line with the Pacific Ocean raging below. The little beach beyond looks like it has never felt a human foot upon it. A view like this begs to be captured on canvas with careful rendering so as to not spoil the mood of the piece. 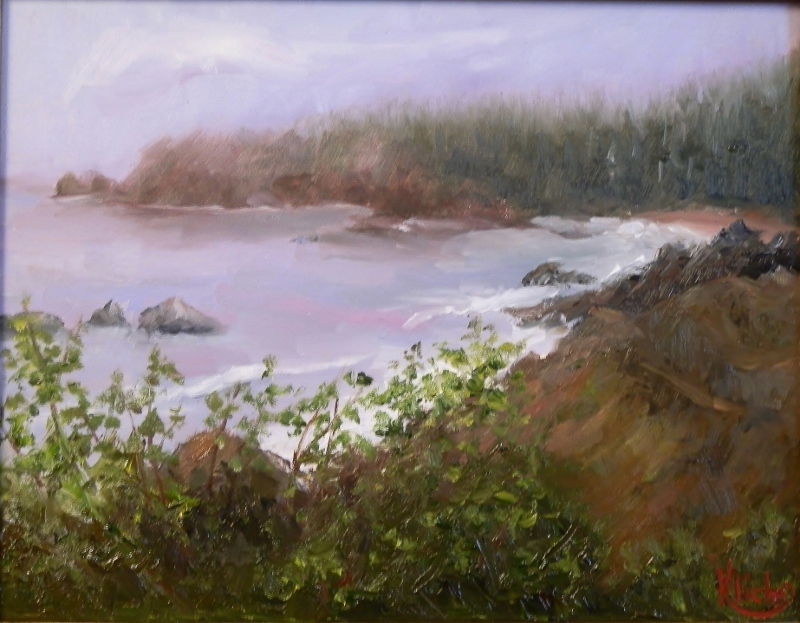 To view this episode of “Painting Journeys”, click on the highlighted title of the painting, “Pacific Coastline”, or go to http://www.wscssheboygan.com. Go to VOD (video on demand), select the playlist “Painting Journeys.” “Pacific Coastline” Great Northwest.